Wow, this has been a hard one to write! I’ve started it several times and – well, I guess maybe I kinda wanted to chicken out. But, I think I’ve finally got the courage to finish it, so here ya go! For those of you who continue to be curious about the whole “colostomy” thing (FAQ’s include: “what does it look like?” and “is it painful?”), here’s my crash course in all things ostomy – at least all the things I’ve learned in the last seven weeks of living with one. All the health care folks who’ve seen me say I have a “text book” stoma – it’s nicely “budded” (that’s the actual term) and uniformly round. It makes fitting the wafer (the part of the bag that adheres to my skin) easier because it’s a perfect circle and not some odd shape. And since my stoma protrudes properly (it’s not sunken in), I can get a good seal with the wafer. Thankfully I don’t have any folds or creases in my belly (yet! ), so I don’t need extra rings and other sticky stuff to fill in any gaps between the wafer and my skin. The round part is what’s called the wafer. 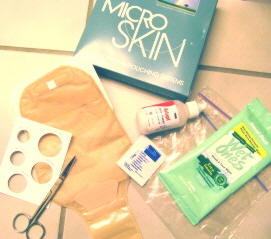 You peel off a cover to expose the adhesive and it sticks to your skin like a big bandage. 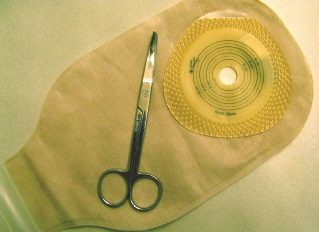 The printed circles are a guide to use for cutting the right size opening for the stoma. From the time of the surgery until now, my stoma has shrunk a little (as expected). It should settle into its final size by about eight weeks. After that, I can order the bags to be “pre-cut” with an opening that’s the right size for me. Meanwhile, I’ve needed to cut the hole myself in order to get the proper fit each time. Of course, there’s the need to keep everything sanitary during the process – hence the wipes. 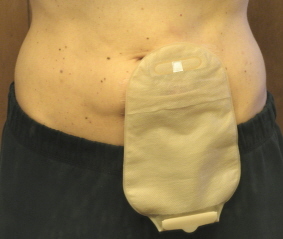 The used ostomy bag goes in a zip-lock baggie (double-bagged!) and gets thrown in the garbage. The whole process takes me about ten minutes. And, voilà! Off I go…until next time! Brava, girl! Succinct, clear-eyed reporting. You’re an editor’s dream. Your candor and equanimity really help shine a light on this much-avoided subject (which is a fact of life for far more people than we might suspect). BTW-Your tummy still looks a hell of a lot better than mine! All my questions answered and a very brave post. Thanks! I sit in awe of you for braving the ostomy waters and sharing so intimately. As I read your post, I kept having the image of diaper changing, especially poopy diapers. Then at the end of the post you shared the commonality as well! Your courage, humor, openness and healing are gifts you share that help so many. THANKS for sharing!! and it is good to hear from you. Karen…you have come a long way baby!! I am in amazement yet again at the candid way you are sharing and teaching us and helping us keep our own lives in proper view. Keep on writing to us. We are loving you! thank you for being so open and honest. if i may inject a bit of humor, this reminds me of fitting a new vacuum bag on my electrolux. pop it off, chuck in trash, pop on a new one and you’re good to go till it’s full of gunk again. oh and by the way, your belly button is so cute! 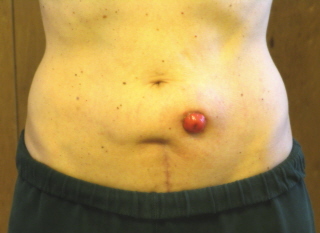 Only from a nurse… your stoma is beautiful and the surrounding skin picture perfect. You are so amazing to share this with all of us and it will actually help me be a better nurse. You are wonderful Karen and i am so glad that we met all those years ago. Thank you so much for sharing this valuable information. I am a nursing student and was searching for more info on stomas. Your post was more helpful than anything I read in my textbooks. Thank you very much and best wishes to you and continued good health. Thanks so much for your words. It’s been just over a year since my surgery and I’ve learned sooo much more about living with an ostomy! I think it may be time for an updated version of this post – some of the info is a little outdated already! 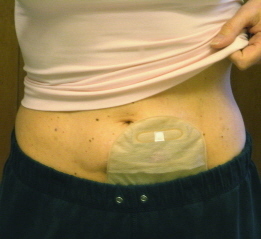 But, still, I’m glad to have been able to help anyone who’s in need of info on ostomies and stomas. Check back again soon – I’ll try to get a follow-up post done. Best of luck to you in your training too!